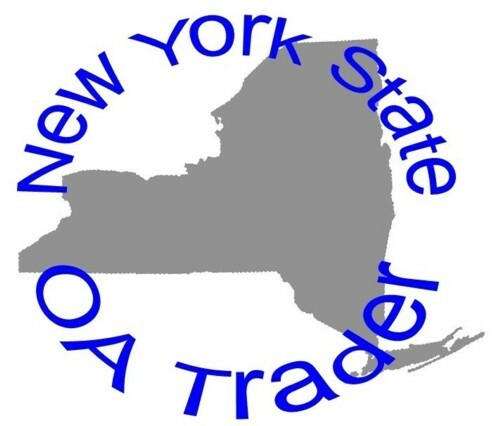 Sharing information about new Lodge and Chapter issues from New York State, the discovery of uncatalogued issues, warnings about fakes, spoof, and reproductions and other information that may be of interest to other OA Collecters. In an earlier post on June 6, I noted "According to Scott Bracken, Tkaen Dod will be issuing 3 two-piece sets for the 2005 Jamboree. 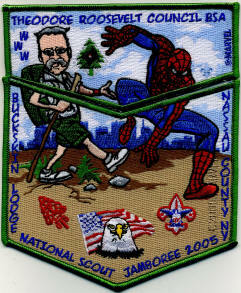 The Red Mylar border will be the fund raiser (pictured below). There will also be a trader and a delegate set." The flap from the trader set is pictured below. The X issue is common to all 3 sets. 172S18 Thanks to George Jennings for the scan. 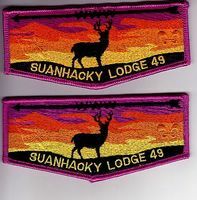 Suanhacky Lodge has issued a chenille to members of its 75th Anniversary Committee who "gave exceptional service to the anniversary effort." 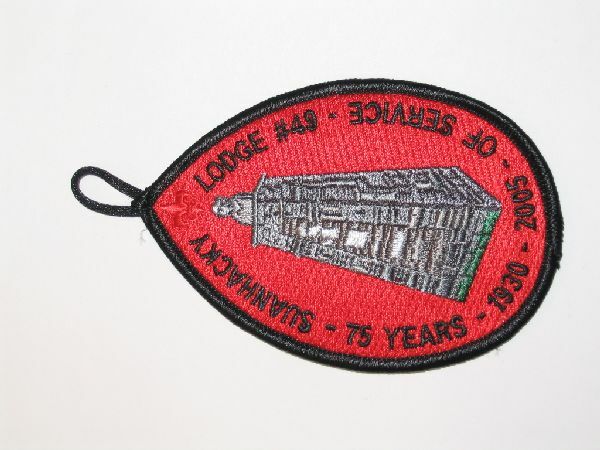 49C7 Thanks to Eddy Peterson who has provided much of the information on the recent 75th Anniversary issues from Lodge 49. I don't think I've reported this one before, but there are two variations of the 49S40. The S40a (on top) was the first with darker yellow lettering and orange sky. 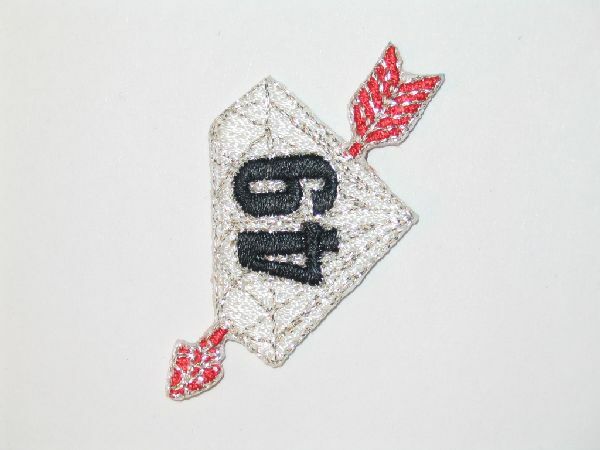 The S40b has pale lellow lettering and while not mylar, the orange is the sky has a 'metallic' sheen to it (that does not show well in the scan). 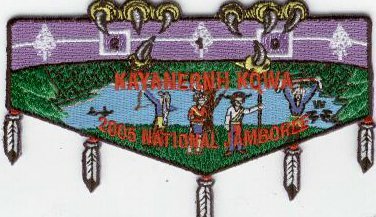 Kayanernh-kowa Lodge #219 has issued a 2005 Jambo Flap pictured below. Because I am only working from an image, I am unsure of the border color so BB stats will be updated at a later time. 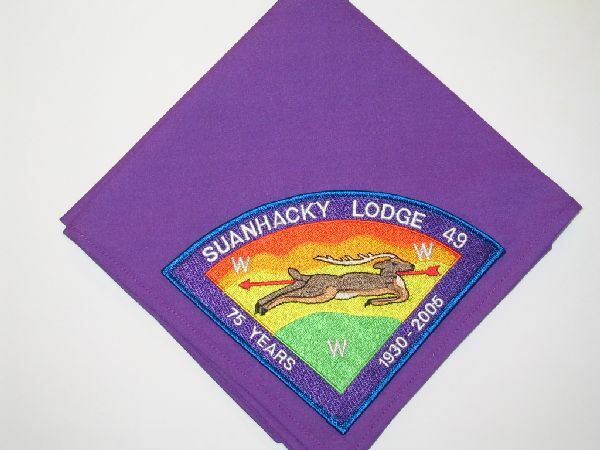 Suanhacky Lodge has issued a chevron style patch for its members who are attending the 2005 National Jamboree even though the patch contains no mention of the event. 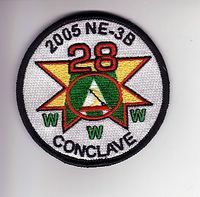 The design is identical to the X26 issued for their 75th Anniversary with the exception of a border color change from Black to Yellow as pictured below. 49X27 Update 06-13-05 from Eddy Peterson of Sunhacky Lodge "The chevron is meant to be paired with the 75th Anniversary Flap (S43)to complete the set. 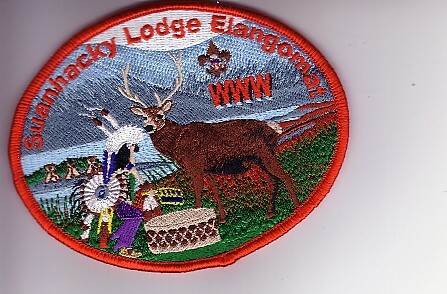 I believe that this patch came about as an error by the manufacturer and the lodge decided to give them to the Jambo contingent members, hence there is no mention of the Jambo on the chevron"
Suanhacky Lodge has issued a Pie-shaped patch both on and off the neckerchief commemorating its 75th Anniversary. The Blu Book designation should be the P3. 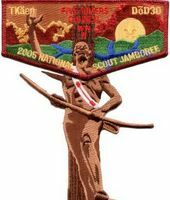 According to Scott Bracken, Tkaen Dod will be issuing 3 two-piece sets for the 2005 Jamboree. The Red Mylar border will be the fund raiser (pictured below). 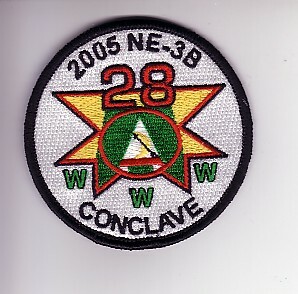 There will also be a trader and a delegate set. 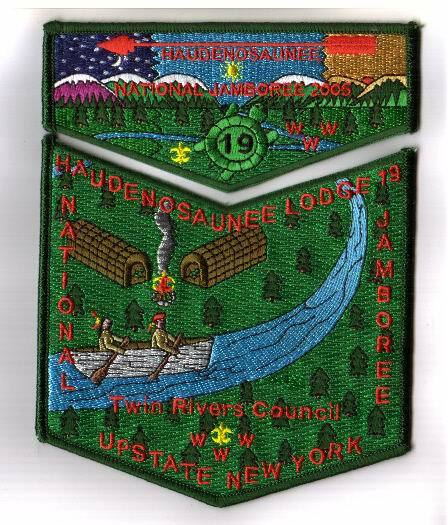 David Fritts writes, "The Haudenosaunee Lodge 19 2005 National Jamboree 2 piece patch sets have just come in. The patch is a mixture of our previous lodge flaps. 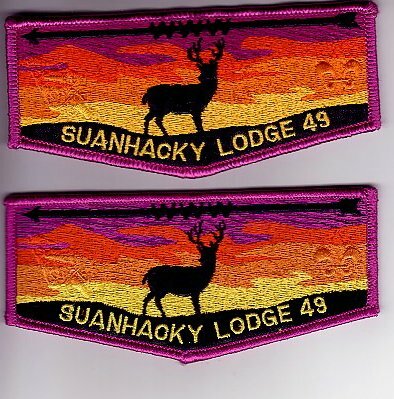 The first section is our night flap, the second is the day flap, and the third is our current sunset patch. 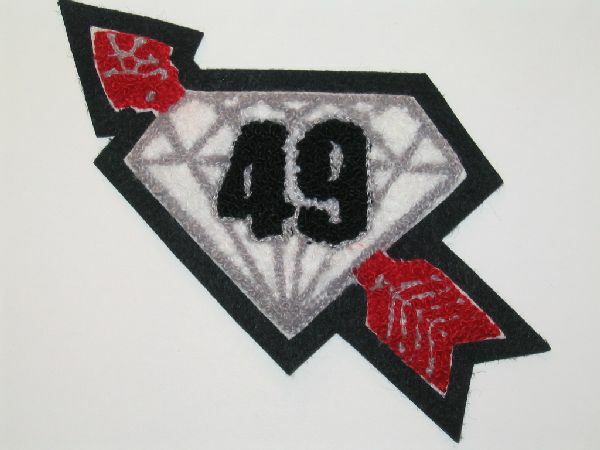 Inclosed is a scan of the patch." 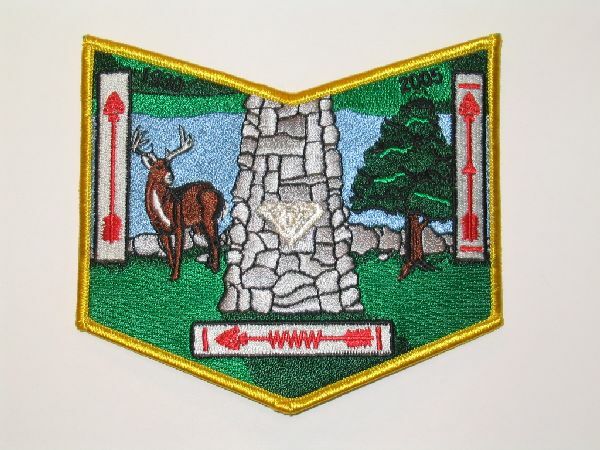 I undertand that some of the sets will be signed and numbered by the designer on the reverse, but will otherwise be no different from the "regular" issue. This set shoul be the S12/X6. Following up on its Marvel Superheroes JSP set from the 2001 Jambo, Theodore Roosevelt Council is again issing a number of Marvel-themed JSP's for the 2005 Jamboree. 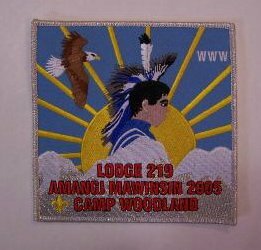 This time around, Buckskin Lodge is involved too as they have added a 2-piece set with a Super hero theme. I've always been collecting something as long as I can remember. 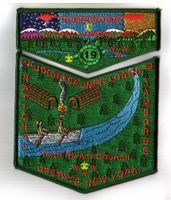 My current collections include all NYS OA issues, NYS Camps, NYS Section conclaves and all Ten Mile River Scout Camp Issues.